Traditional forms of collaboration are not sufficient for competing effectively in the more complex and dynamic environment of today’s business world. Face-to-face meetings between people of similar backgrounds have given way to increasingly complex working relationships. Organizations must be able to gain rapid access to knowledgeable people to meet constantly changing conditions and demands. More fluid, flexible, and easily reconfigurable collaborative relationships are necessary to produce the innovations that can make or break organizations¾even entire industries¾ and provide the opportunities that attract the talented and motivated employees who will make the difference between success and failure. 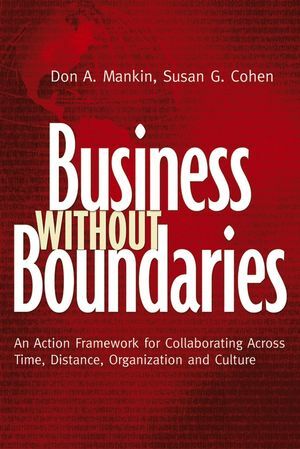 Business Without Boundaries helps managers address these challenges. The authors explore a number of wide-ranging, real-world cases to identify hands-on principles for successful collaboration. They offer managers and executives practical steps and tools for creating, facilitating, and supporting complex collaborations throughout their organizations. And they explain how to “team” across boundaries in the new global economy. The recommendations are specific enough to apply to particular forms of complex collaboration (for example supply chains, global product development teams, interorganizational alliances) but general enough to apply to new forms that have yet to emerge. Don Mankin is the president and founder of Co:e-laboration Design Associates, a consulting firm specializing in the development of complex collaborations involving dispersed teams, multiple organizations, and diverse cultures. He is the author of four books and numerous articles on team development, systems implementation, and collaboration in a global economy. Susan G. Cohen is a senior research scientist at the Center for Effective Organizations at the University of Southern California. She is coauthor of two books and author of numerous articles and book chapters about teams and teamwork, employee involvement and empowerment, and human resource strategies. CHAPTER 1: Introduction – Business Without Boundaries in the New Global Economy. CHAPTER 2: Across Organizations – The John Deere Construction and Forestry Technology Program. CHAPTER 3: Across Time, Distance, and Culture – The Radica Games Group, Inc. Case. CHAPTER 4: What the Radica Project Tells Us About Collaboration Across Time, Distance, and Culture. CHAPTER 5: Across the Supply Chain – The Solectron Case. CHAPTER 6: What the Solectron Initiatives Tell Us About Collaboration Across the Supply Chain. CHAPTER 7: The Action Framework Part I – From Setting the Stage to Getting Started. CHAPTER 8: The Action Framework Part II – Conducting the Project From Beginning to End. PRACTICAL TOOLS: Managers and executives will find actionable steps, not abstract theories and vague speculations. RESPECTED AUTHORS: Authors are well-respected in the field with strong academic and professional credentials. WELL-KNOWN CASE COMPANIES: Features in depth case studies of John Deere, Radica, and Selectron.